Join Doyle Davidson and other ministers of the gospel ministering with power in word and in song. 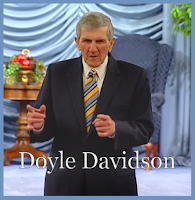 Tonight Doyle ministers from these passages of scripture, sharing how this was his prayer he had prayed for many hours, as well as scriptures he taught in Water of Life Christian Training School, but people didn't want to hear them and did not listen. Kathie Davidson preaching the gospel, and ministering that you must forgive every person in order for the gospel to work in your life. "That's What the Cross is For"